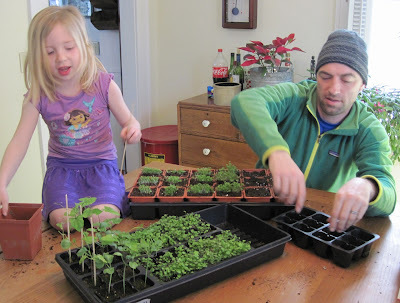 The absence of gardening weather has not stopped us from planting seeds. We like to get a head start where our veggies are concerned, to maximize our summer yield. And now that we have a place to put everything, we are really going for it. We are also throwing some flowers in the mix. It began last month. We sowed forget-me-nots, lobelia, alyssium, black-eyed-susans, cardinal climbers, and two different varieties of cherry tomatoes. Almost every single seed germinated. Yesterday the seedlings were transplanted to bigger pots to accommodate their growth. 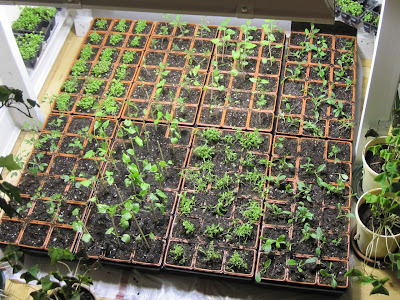 In the empty seed starter pots we planted large tomatoes, leek, corn, cucumber, okra, echinacea, marigolds, and more lobelia. If they too germinate well, and why wouldn't they, we will have nearly 400 plants living in our dining room. The plan is for them to go to the greenhouse, but obviously it's still too cold for that. Not to mention part of the greenhouse roof blew off this winter and that needs to be fixed first. Which reminds me, I have never shown you any pictures of our greenhouse, have I? Last year we turned the dilapidated potting shed into a cute little greenhouse by replacing the old windows with floor to ceiling ones, and installing clear acrylic sheets on the sunny half of the roof. I'll dig up those pictures and post them tomorrow. Rumor has it it's spring. I have yet to see any proof. It's very cold outside, there is about a foot of snow and ice on the ground, and it only just stopped snowing. I planted bulbs last fall, but they have a long way to go. And not a single robin has been spotted in these parts, just a few geese earlier this week. There is hope, though. I looked out the window a few moments ago, and noticed a little head sticking up from the snow. The chipmunks are up! He, or she, had dug a tunnel through the remains of the ice castle that Ryan and Lola built, and sat there, quietly looking around. He seemed somewhat confused by what he saw, and after a few minutes went back into his underground home. I'll toss out some homegrown sunflower seeds for them. The birds are not too keen on them and it will be awhile before the grass is back.